I really needed an excuse to buy bourbon, you see. Scratch that — I really needed an excuse to make pancakes. Fancy pancakes. Pancakes with pizazz. 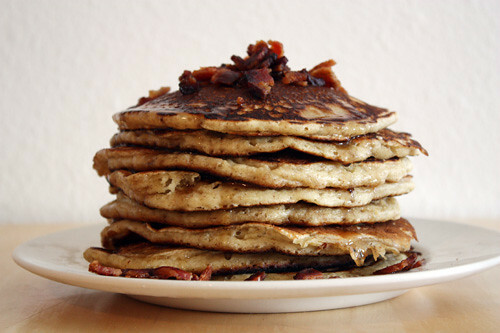 And what better way to give your pancakes pizazz than to mix them with bourbon (yum) and bacon (double yum)? There is no better way. These pancakes aren’t as good as they look. They’re better. Like in an “oh-my-gosh-I-could-eat-that-whole-stack-of-pancakes-topped-with-12-pieces-of-bacon-and-a-gallon-of-syrup-right-now” kind of way. Like in an “I-need-to-unbutton-the-top-button-of-my-pants-at-breakfast” kind of way. Like in a “these-are-so-indulgent-that-I-feel-like-I’m-sinning-just-eating-them” kind of way. Just looking at them seems like a sin — a tasty, delicious, syrupy, bacon-y and bourbon-y sin. The kind of sin that makes you forget that you just had 100 proof alcohol and your daily fat/calorie intake at breakfast. Whatever. They’re too good to worry about such trivial things. I don’t know what came over me when I decided to make these pancakes. I didn’t even have bourbon in the house when I decided to make them. Or bacon. And yet, it was worth the mission. So I went to the store, bought my first (yes, very first) bottle of bourbon and a package of bacon, all for the sake of making these magical pancakes the next morning. If only the cashier knew what I was really doing with that bottle of bourbon. I opted for the recipe’s original call to top the pancakes with said bacon instead of mixing it into the batter, which my husband had requested. It was incredibly delicious having a mini-mountain of crisp bacon atop my stack of pancakes, though I think next time I’ll try putting the bacon in the batter, just to mix it up. Adventurous, I know. 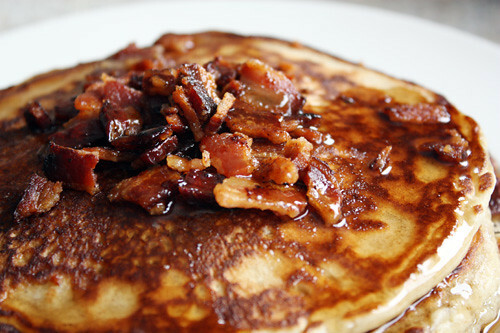 Hey, when you’re making bourbon bacon pancakes for breakfast, you can do just about anything you darn well please. In a large bowl, combine flours, sugar, baking powder, baking soda and salt. Whisk in buttermilk, butter, eggs, vanilla and bourbon and mix until the batter is smooth and free of lumps. Ladle 1/4-cupfuls of batter onto a hot buttered skillet and cook until bubbly. Flip over and cook until a deep golden brown on the bottom. 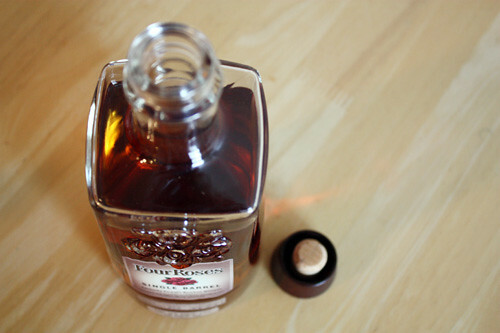 To make the syrup, heat maple syrup and bourbon in a small saucepan until warm. 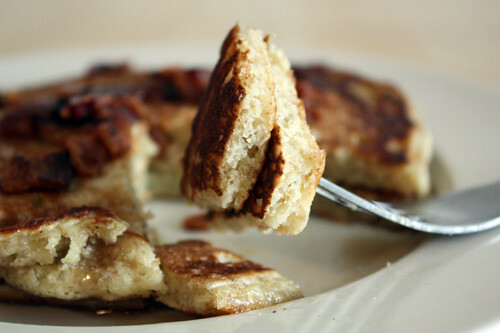 Pour over pancakes and use crumbled bacon for topping. Wow, does that look good. It’s been a long time since I’ve had pancakes…this post may change that fact. Oh my geebus. The hubs is going to thank you for these, I promise. They say the way to a man’s heart is through his stomach. This little recipe will be my sooper-secret weapon. I can’t even eat it (not 21) and it sounds delicious.